The firm has more than 9,800 advisors in its independent and employee channels. Ameriprise's head office in Minneapolis. Ameriprise Financial Services Inc. (AMP) has reported third-quarter earnings of $397 million, or $2.17 per share, vs. profits of $420 million, or $2.17 per share, a year ago. On an adjusted basis, though, results improved 5% to $429 million, or $2.35 per share, vs. $407 million, or $2.10, last year; these results beat analysts’ estimates. The financial services company, which was spun off from American Express in October 2005, posted revenue of $2.9 billion in the period, down from $3.1 billion in Q3’14. The company, though, was able to trim operating expenses by 1% in the period to $2.3 billion, including a 4% drop in general and administrative expenses. “Ameriprise had a solid third quarter given the backdrop of declining and volatile equity markets, unfavorable foreign exchange and persistently low interest rates,” said Jim Cracchiolo, chairman and CEO, in a statement. “In Advice and Wealth Management, we’re serving more clients and delivered another strong quarter for experienced advisor recruiting, both of which contributed to good client flows and helped balance market-related impacts in our other businesses,” Cracchiolo explained. Total assets under management and administration were $766 billion – with Advice & Wealth Management advisor client assets totaling $433.5 billion, down slightly (by about $300 million) from a year ago “as lower equity markets were partially offset by continued strength in fee-based investment advisory net inflows, including $3.0 billion of net inflows in the quarter,” according to the company. On a trailing 12-month basis, operating net revenue (or fees & commissions) per advisor grew 6% to $514,000. The total number of advisors grew to 9,814 vs. 9,712 in the prior quarter and 9,696 a year ago. 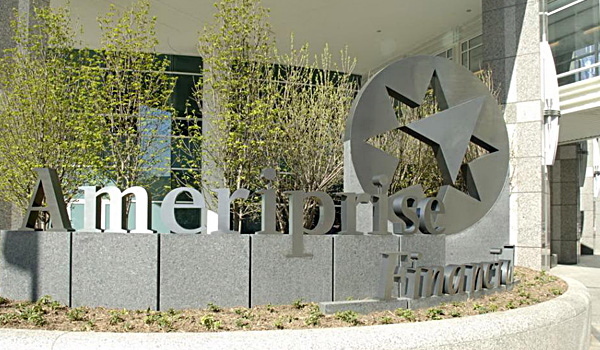 It has 2,099 employee reps and 7,715 independent reps.
During the quarter, Ameriprise completed the acquisition of the retail assets of JHS Capital Advisors, which added 53 advisors and $1 billion of client assets. In addition, the company says it added 95 experienced, highly productive advisors in the quarter. Also in Q3, the company rolled out its “Be Brilliant” brand platform. Wrap net inflows were $3 billion, and wrap balances rose 3% to $174 billion. — Check out Raymond James Missed Estimates but Had ‘Great’ Q3: CEO on ThinkAdvisor.